The late novels of Henry James, particularly those such as The Golden Bowl, The Wings of the Dove and The Ambassadors, problematize the notion of integrity, or at least lend it a certain kind of complexity which is immanently connected to social-historical conditions. In this sense, as Robert Pippin suggests, James’ novels offer a historicised version of moral categories. James attempts to portray a new constellation of moral dilemmas with the rise of new forms of capitalism and materialism, and this raises questions about new forms of relationality, (self)evaluation and moral concepts such as integrity. The later novels deal with questions not only of individual integrity but also of integrity in relation to others, especially the way in which characters potentially compromise decent relations with others in achieving their goals, desires or needs. The most fundamental experience for James’ characters is one of entanglement with and dependence on others. The dilemma they are continually confronted with is how to live a life of one’s own within these (inter)dependent conditions; how to navigate or negotiate ‘living all you can’, as Lambert Strether puts it in The Ambassadors, in the context of relations with others. In James’ later novels, ‘integrity’ is often associated with a notion of freedom and reflexivity, as well as a sense of the individual’s life having some sort of meaning. For characters such Lambert Strether in The Ambassadors, however, meaning and the ‘getting of wisdom’ is often achieved only ‘after the fact’; that is, after the realisation that he has been deceived by others or has been living a life constructed by others. Rather than invoking a kind of ‘puritanism’ or moralism in response to such deception, James demonstrates the ways in which characters such as Lambert Strether incorporate the actions and interpretations of others into new forms of moral understanding. The later novels, then, continually explore the tension between subjectivity and dependency, including understandings and interpretations based on the consciousness of others. This, however, does not necessarily represent a form of self-deception but, as James terms it in The Ambassadors, operates as a sort of ‘double-consciousness’. This paper focuses predominantly on the character of Lambert Strether in The Ambassadors, in order to explore Pippin’s suggestion that James’ novels evoke the idea that such social dependency and moral uncertainty “make at least any straightforward reliance on a moral virtue like integrity” extremely “difficult and risky.” In this sense, James’ late novels suggest that ‘integrity’ cannot simply be thought of as an individualistic or subjective category but one of moral and intersubjective complexity, one that can only be understood in ways that are socially and historically specific. In this respect, the paper explores the Jamesean notion that ‘integrity’ might be understood as “what plays you least false” in the context of a life with others. One of the difficulties one comes up against when considering the concept of integrity, is the unliveability of the lives of moral exemplars. If we don’t want to give up all our worldly belongings, leave our families, eschew pleasure and comfort, or go and fight in the resistance, does that leave us compromised and corrupted? If so, shouldn’t we stop worrying about integrity and adopt a more pragmatic — more realistic — outlook? The suggestion I want to extract from Anscombe’s work on ethics and religion is that the thought that integrity is unliveable can itself lead to corruption, precisely because it leads to the sort of attitude just described. Anscombe insisted that it is practicable to live a life of integrity which is also a quite ordinary life of family, work, friends, politics and compromise. To see this, she thought, we need to return to an older—Hebrew-Christian—conception of ethics, in which morality does not create obligations and duties but rather places limits and restrictions on what is permissible to do. Limiting one’s possibilities for acting well, she thought, does not mean adopting standards that only the morally exceptional could meet. When individuals act as members of large organizations, they are under various pressures, psychological and otherwise, to adapt themselves to the norms and standards of their organizational role. This, however, can undermine their moral agency and it can create moral risks as organizations with passive members can easily get morally side-tracked. In this presentation, I discuss how moral agents can relate to their organizational roles and the psychological pitfalls they create. I use the example of an interviewee, whom I call Albert, to develop the concept of „transformational agency“. „Transformational agency“ describes a commitment to basic moral norms and to a normative conception of what it means to fulfill one’s role well. It also implies a willingness to critically scrutinize oneself and one’s relation to one’s role in order to avoid the two dangers of déformation professionelle on the one hand, and unrealistic attempts to remain completely unaffected by one’s role on the other. Transformational agency combines these commitments with local knowledge in order to find solutions that keep organizations morally on track. I use the case of Albert and his career in various financial institutions to discuss how transformational agency can express itself, in Hirschman’s classic distinction, in terms of „voice“ and in terms of „exit“. Johann Gottlieb Fichte (1762–1814) was a central figure in German Idealist philosophy. The author of an impassioned defence of the French Revolution, Fichte believed that the vocation of the human being is to transform reality in accordance with the demands of practical reason. All human activities should be subordinated to the pursuit of this goal, and the role of the philosopher is to lead and supervise humanity’s moral progress. For Fichte, the philosopher should not simply think; she should act, and, in acting, inspire others by her example. In the estimation of some of his contemporaries, Fichte embodied this lofty ideal. Thus, Friedrich Schlegel described Fichte as “a man for whom Hamlet would have sighed in vain: every feature of his public life seems to say: ‘here is a man’”. Although the word “integrity” (Integrität) is seldom used by Fichte, there is a distinctively Fichtean conception of what it is to be a person of integrity. In this essay, I explore that conception in relation to Fichte’s transcendental philosophy and his famous doctrine of “striving”. In the first part, I argue that Fichte’s conception of integrity is based upon his thesis that the human self is fundamentally “divided”. In the second part, I draw upon the work of G. W. F. Hegel (1770–1831) to consider the plausibility and attractiveness of integrity as conceived by Fichte. In the same historical moment, Charles Péguy (1873-1914) sought to champion an integral life aligned with the virtues— in part by bluntly acknowledging that the civilization that had long paid tribute to virtue ethics had deeply compromised it through its various (political, religious, educational) instantiations in modern culture. He sought to think and live a life of integral virtue that would at once acknowledge and surmount the criticisms that had begun to accumulate around integral aspirations in the late modern West. The possibilities and limitations of Péguy’s defense of virtuous integrity are the subject of this paper. During the age of Enlightenment, integrity was seen as synonymous with the rational and benevolent propensities of human beings. Both materialists such as John Locke and sceptics like David Hume regard the self as a composite of sensory experiences that resist a single ‘fixed’ identity. Yet this interdisciplinary paper explores how two figures from either end of the eighteenth century challenge the idea that acting with integrity depends upon subordinating the self to reason. Opening by reading Bernard Mandeville’s The Fable of the Bees (1714), it scrutinises the latter’s controversial paradox that ‘private vice’ is the catalyst to ‘public benefit’. Drawing attention to the Fable’s allegory of worker bees who must choose between a ‘virtuous’ yet primitive existence, or a prosperous yet corrupt society, the paper focuses on Mandeville’s contribution to legal debates, as well as to the emerging discipline of political economy. By pointing to his critique of the way that rational ‘civilisation’ teaches an artificial code of morality, it argues that Mandeville re-orientates integrity in an alternative direction. While the Fable maintains that selfishness remains ‘vile’, notwithstanding its beneficial side-effects, the paper goes on to examine how Mandeville’s ethics are transformed in the oeuvre of Adam Smith. Investigating Smith’s conviction that individuals can ‘only’ imagine the ‘situation’ of others through their own interests, it addresses how the self inspires social sympathy in The Theory of Moral Sentiments (1759). Furthermore, by tracing the process through which Smith’s imaginative approach to self-interest impacts upon his metaphor of ‘the invisible hand’ in The Wealth of Nations (1776), it posits that the latter reconceptualises Mandevillean vice to facilitate socio-economic harmony. Through outlining such shifting attitudes towards human nature, this paper considers to what extent ‘integrity’ can be viewed as a malleable concept during the long eighteenth century. Titus Pomponius Atticus was not a great man. In ancient Rome great men distinguished themselves through political and military feats which were commemorated in biographies. Atticus’ honesty prevented him from seeking public office, as he claimed it could not be done without resorting to bribery. This position is somewhat surprising given that men born into the elite, as he was, were expected to participate in political life. Nevertheless The Life of Atticus by Cornelius Nepos depicts him as a man of integrity, citing qualities such as traditional values (mos maiorum), sense of duty (officium) and devotion to family (pietas, pater familias). Or does it? The many irregularities in the contents and format of this little-researched work are difficult to ignore, not least because they raise questions concerning integrity. Can an individual be said to possess integrity when it is based on his own narrow interpretation of ‘values’ and ‘duties’, and one that it appears to run counter to that of the society in which he lives? Can integrity be based on inaction and financial largesse (liberalitas) when men like Cicero were judged on their actions and accomplishments? This paper proposes to examine in detail how Nepos goes about constructing this portrait and what can be learned about integrity from this potentially unsuitable subject. It is always possible that Atticus believed himself to be a man of upright moral standing. Yet in a sense The Life of Atticus does not offer the portrait of one man, but of integrity itself and what that meant to Romans. This paper examines how Friedrich Christoph Dahlmann (1785-1860) and Georg Waitz (1813-1886) served as models of scholarly integrity in nineteenth-century German historiography. Drawing on a rich array of letters, lectures, and obituaries, the paper points to the existence of two distinct, sometimes overlapping, but essentially different models of integrity, which can be characterized in virtue language as ‘conscientious’ and ‘well-balanced’, respectively. Both Dahlmann and Waitz were seen as embodying the first model (Gewissenhaftigkeit) to the extent that they paired a firm commitment to a single cause with ascetic indifference to the price they had to pay for this. In Dahlmann’s case, it was his public protest against an unlawful alteration of the Hanoverian constitution by King Ernst Augustus in 1837 that earned him a reputation of integrity, especially when this act of civil disobedience led to his dismissal from the University of Göttingen and banishment from the Kingdom of Hanover. Waitz, in turn, became known as an example of conscientiousness because of his meticulous research and skepticism towards public demands for well-written history books and unambiguous lessons from the past. At the same time, the names of Dahlmann and Waitz served as shorthand for two rather different scholarly personae, or models of what it meant to be a historian, based on two largely irreconcilable job descriptions. While Dahlmann became a prototype of the ‘political professor’, whose historical scholarship almost seamlessly merged with political activism, Waitz came to be seen as an archetypical ‘researcher’, who sacrificed relevance and public recognition at the altar of truth. Interestingly, both of these personae were defended in terms of balance between different demands made on the historian, with balance counting as a moral obligation: ‘one-sidedness’ was almost universally considered a vice. Although the second model was less straightforward than the first one, both of them were virtue ethical models that regarded character strength as a key to scholarly integrity. Both also assumed that virtues are means towards ends and that, accordingly, talk about integrity remains idle as long the ‘ends’ or ‘aims of science’ are not properly defined. Ella Baker, a key leader of several of the most influential organizations of the U.S. Civil Rights movement, remains relatively unknown compared to some of her peers. This may be due in part to the fact that, in her words: “I never worked for an organization but for a cause.” It may also be due to her clashes with prominent figures such as Dr. Martin Luther King, Jr., which led to her resignations from top positions in the National Association for the Advancement of Colored People (NAACP) and the Southern Christian Leadership Conference (SCLC). These conflicts were prompted by the way she trusted—and strove to empower—the intelligence and self-determination of the masses of poor uneducated Blacks, rather than the leadership of a Messianic few. In her six decades of activism, Baker was affiliated with some forty-odd political organizations (much to the bewilderment of the FBI agents writing her file). This history reflects her commitment to navigating around and occasionally switching sides on divisive issues, e.g. whether to confront anticommunism, and whether to adopt nonviolence as a mere tactic or as an end in itself, in order to work productively alongside people with whom she had significant ideological disagreements. She also defied class and gender norms by giving up the financial security that could have been guaranteed by her middle-class background, and by keeping her marriage and subsequent divorce almost entirely secret from the public. Baker’s life thus raises questions around what it means to have political integrity – to break or maintain alliances, to uphold or compromise ideological purity, to incorporate or excise one’s personal life from political work, and to avoid or take risks in the dangerous business of pushing liberatory movements in the face of violently repressive forces. Through his public career (between 1739-1791), John Wesley became regarded as the foremost leader of the Methodist movement, which was increasingly distinct from the national Church of England. Always careful to maintain his own public image, he was regarded as a model of pious virtue by his followers, but by his detractors as, among other things, a threat to the integrity of national coherence expressed in the Georgian church. Wesley’s reputation as a man of Christian moral and religious integrity was marred by both public and personal aspects: his failed marriage; increasing tensions with his brother (Charles Wesley, the hymnwriter); frequent – and often unacknowledged – plagiarism of other writers; divisions between evangelicals and the complaints of disaffected former preachers. Do painted portraits and later scene paintings, and resultant prints, illuminate or ignore such issues? More pertinently, were caricatural and satirical images of Wesley and the Methodists a reflection of this? At the outset of the Methodist movement from the 1730s, the national church maintained an almost absolute hegemony; by the end of the nineteenth century religious affiliation (and even non-affiliation) had become a matter of voluntary choice. In the first half of the nineteenth century the Methodist movement itself disintegrated into a cluster of sub-denominations whose recognition of Wesley’s legacy varied. The paper will thereby take account of not only Wesley’s integrity in his lifetime, but how it might be articulated in the posthumous evolution of his image, both visual and virtual. Building on the speaker’s longstanding research into images of John Wesley, this paper will thus consider both Wesley’s personal integrity and public perceptions of him set against the religious integrity of both British society in general and the church denominations themselves. I am taking ‘portraits’ of your title literally, and would propose a paper on the very crude, ‘vernacular’, portraits of the minor Yorkshire gentleman John Kaye (d. 1594) and his wife Dorothy of Woodsome, Yorks. Kaye was rising up from the yeomanry at a time of dynamic social mobility following the Henrician Reformation, and he wished to assert his claims to gentility asa part of that social striving. One of those claims was his striking emphasis on his and his wife’s personal integrity. Precociously for his time, he chose to do so in the form or portraiture, and had two crude portraits of himself and his wife painted for display in his modest hall. But native English portraiture was still very much a new and malleable form of expression: the crude, vernacular native tradition not having yet caught up with the more academic, formal and polite portraits found elsewhere in Western Europe at this time. English painters, especially in such rural areas and serving such a modest social clientele, were not yet able to convey qualities like integrity purely by visual means. And so John also had autobiographical poems limned onto his portrait and his wife’s to state in clear terms what he meant by integrity. Hooping by lyke to have such gaine/As after death to lyve again. These portraits, and poems, define (and were intended to define) for the viewer John’s newly acquired social status, and the elements of personal integrity (along with his considerable economic mobility) on which they rested. In A Fortunate Man John Berger presents us with a portrait of a country doctor working in a remote rural English community. In this paper I want to investigate what A Fortunate Man can tell us about the virtue of integrity. Integrity is often claimed to be a difficult virtue to define, Greg Scherkoske for example describes it as ‘an elusive virtue’. As a result, there is disagreement amongst philosophers about what exactly this virtue consists of. One account that has been proposed, by John Cottingham (2010) amongst others, is The Unified Self View. On this account integrity is a formal relation of coherence between various aspects of a person. One problem that has been raised against this account is that it isn’t obvious that The Unified Self View can account for the value of integrity. The concept of integrity was central to the self-definition of Dissenting communities: having refused to conform to the Thirty-nine Articles of the Church of England, they suffered civil penalties and discrimination for the sake of their beliefs. Their refusal to obey the Church was popularly equated with a tendency to rebellion, against bishops, kings, and ultimately God. In response, Dissenters positioned themselves as the true followers of God, as a people who had sacrificed for their beliefs and whose continued suffering proved their integrity. They defined themselves against a rich and corrupt established Church, annoying Anglicans by positioning Dissent much as the Church of England had situated itself against the Church of Rome, and claiming a purer, truer understanding of the Bible. In this paper I will explore integrity in the works of Anna Laetitia Barbauld (1743-1825), a Presbyterian writer in many genres. In particular I will explore the importance of integrity to her writings in the wake of the renewed suspicion and hostility towards Dissenters following the 1789 French Revolution. As is evident in her poem ‘To Dr Priestley’, portraits of integrity were important to Dissenting communities, as they were a means of validating the courage and honesty of those who had worshipped and preached in defiance of the established Church. In 1791 Church and King mobs attacked the house of Barbauld’s friend Joseph Priestley, destroying his library and laboratory. Barbauld was one of those who published in praise of Priestley, denouncing those who had set his house on fire and burnt him in effigy, and in typical Dissenting manner, her poem asserted that posterity would recognise Priestley’s patriotism and integrity, even if his contemporaries denied him his rightful thanks. Although not usually recognised as such, Hannah Arendt was in many ways both a theorist and an exemplar of integrity. Central to her moral thought is the integrity derived from the ‘two-in-one’ she perceived in Socrates’s philosophical method, whereby the individual must not be variance with herself when acting upon (or speaking about) what she knows to be true or good. And central to her political thought is the integrity of the polis, a realm of appearance and recognition wherein actors persuade one another of the truth or rightness of a course of action, so that public life may be administered in a pluralist and democratic manner. Arendt was fierce and sometimes unbending in her convictions – even to the point of personal and self-acknowledged disagreeableness – and her commitment to her own intellectual integrity lost her a number of friends, most notably during the ‘Eichmann controversy’ of the early 1960s. Yet the concept of integrity appears only infrequently in her writing, and, ironically enough, her various uses of the term sometimes seem to contradict one another. This portrait will develop these complexities in more detail, and offer a speculative attempt to reconcile some of the many versions of integrity Arendt represents in both her writing and her life. Kazakhs led a nomadic life in medieval and modern times. Kazakhs have original system of moral guidelines presented in the traditional legal norms of customary law – adat. The process of joining of the Kazakh steppe to the Russian Empire began in the 30s of the 18th century and ended in the middle of the 60s of the 19th century. Law of the Russian Empire coexisted at first with the adat norms, and then it gradually became the main on the whole of the territory of the Kazakhs. The difficulty was that many of the criminal law, the system of power relations of Kazakh nomads did not coincide with the understanding of the laws of the Russian Empire. For example, Kazakhs prefer to find the perpetrators in the mid-19th century to the aggrieved party can obtain compensation for damage caused by the cattle than to betray the offender punishable under Russian law. Abai is the famous Kazakh poet and enlightener of the second half of the 19th century. Abai had the experience as the volost ruler, it was an officer at the local level. Experience of the volost ruler allowed him to directly observe what changes have occurred in the moral norms of everyday life of the Kazakh population in the spread of capitalist relations in the Russian Empire. He wrote many works, but it does not collect or maintain their creations, as if his life has not been the tradition to publish their works. The tradition of oral transmission words was distributed in Kazakh nomads. Therefore, many of his works written offhand, lost to us forever. The Book of Words (Kazakh: қара сөздері, Qara sözderi) is one of the most famous works. Abai reflected his attitude to his own time, and all the changes that took place in the Kazakh steppe. The paper will be presented a portrait of Abai and his understanding of the integrity of the Kazakh people for the second half of the 19th century. The paper will be prepared on the materials of the Central State Archive of the Republic of Kazakhstan, and the particulars of the museum of Abai. According to the Government Accountability Project ( GAP ) “no whistle-blower at the United Nations (UN) has been fully protected from retaliation for reporting misconduct since the UN Ethics Office was established” in 2005. Paradoxically, UN staff members are duty bound to report misconduct in accordance with the 1945 Charter of the United Nations, which stipulates that personnel must “maintain the highest standards of integrity, including honesty, truthfulness, fairness and incorruptibility, in all matters affecting their official duties and the interests of the United Nations”. A decade of failure haunts the UN Ethics Office due to inability to protect UN personnel. This, which has been borne out in all cases judicially reviewed by the United Nations Dispute Tribunal (UNDT). The judgements illustrate that well-intentioned protection mechanisms and policies have not been properly implemented and are tainted by lack of independence. Moreover, the UN appeals tribunal (UNAT) in a ruling in 2014 determined that the UN Ethics Office is no longer eligible for legal scrutiny. This UNAT judgement bears the hallmark of “the cruel tyranny perpetuated under the shield of law and in the name of justice” which Charles de Montesquieu warned humanity. Whistle-blowers confront unique challenges navigating the “uneven playing field,” of the retaliatory actions of an employer with significantly more resources and power which may include cover up of evidence, attacks on character and performance, reinterpretation of events and intimidation and ultimately ostracism from the work community and drawn out litigation which the whistle-blower can ill afford. This paper will elaborate on the unique challenges that confront whistle -blowers in the United Nations context. Case studies* will draw out experience of their confrontation with abuse of power without protection; will illustrate the on-going serious implications for the core mandate of the organisation if impunity continues unchecked. Gandhi’s life provides us with a wealth of relevant material as we explore the possible meanings of integrity. A sense of integrity was arguably at the very centre of satyagraha, the force born of truth, which required Gandhi and his followers to defy orders and laws that violated core principles of their sense of justice. Instead of giving in to fear and self–interest, the satyagrahi would embody their convictions and act as if they were free, fully prepared to suffer the consequences of their defiance. Leading by example, Gandhi was able to empower his followers to take themselves and their convictions seriously, thereby turning integrity into a method of spiritual, social and political activism. My paper will discuss the bond between Gandhi and his followers that emerged in this process of (mutual) empowerment. Gandhi helped his followers to see themselves differently. He thereby assumed the role of a ‘touchstone’ in that through the encounter with him, they achieved a hightened sense of self-awareness and self-knowledge: “But those who know him well are ashamed of themselves in his presence.” (Joseph J. Doke) In Greek antiquity the touchstone (basanos) was a dark-coloured stone, a flinty slate, on which pure gold, when rubbed, would leave a mark; the mark’s colour revealed the purity and hence value of the gold tested. In Plato’s Laches, Nicias compares Socrates’ effect on his interlocuters to the test performed by the touchstone (187E-188B), because those who converse with Socrates come to say and then see what is truly their own inner thought leaving its mark in their own words. I wish to explore the extent to which Gandhi had a similar effect on his friends, followers and, indeed, enemies. I hope to be able to use Gandhi’s case as evidence in support of two suggestions, namely (a) that the touchstone relation is the underlying dynamics of an attribution of integrity, and that (b) the attribution of integrity is an externalisation which short-circuits the increase in self-awareness occasioned by the encounter with a person who can act as a touchstone. The encounter gives us a glimpse of a truer notion of ourselves, but the hope that we can persevere in this notion is circumscribed by the fear that we may fail. As we reach the limits of our hope, instead of letting our heightened sense of self permeate our being and direct our actions, we objectify the touchstone effect as a peculiar quality that we attribute to others – ‘integrity’. This paper offers a collective portrait of Leo Tolstoy and of some of his late nineteenth century followers. Tolstoy devoted the last thirty years of his life (1880-1910) to expounding his Christian anarchist philosophy in a series of tracts which, at least in part because of his existing stature as a novelist and enthusiasm for his works abroad, were rapidly translated and widely published. Tolstoy’s philosophy was based on the principle of non-resistance to evil by violence. He rejected the state (which could only exist on the basis of physical force), and all institutions that derived from it – the police, law courts, the army, and the Russian Orthodox Church. He condemned private property and money, and advocated living by one’s own physical labour. He also came to believe in abstinence from tobacco and alcohol, vegetarianism, and complete chastity. Although he denied the existence of a ‘Tolstoyan’ movement, Tolstoy’s writings had a remarkable impact on groups and individuals who were disillusioned with modern industrial society and with the politics of the time. 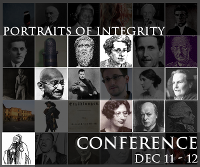 Tolstoy and his followers related to integrity in a number of ways. Firstly, through their efforts to be honest with themselves and with others: to follow their own conscience and reason, and reject behaviours that they felt to be wrong but which were demanded by conventional society. Secondly, through the apparently complete and rounded worldview that they embraced when they became Tolstoyans. Tolstoy’s philosophy required that they bring every aspect of their life into accord with their beliefs: action on a single issue was not enough. His polemics answered the contradiction that many of his readers, whether businessmen, shopkeepers, soldiers or socialists, felt in their lives. He did not allow for any compromise between their ideals and their actions; he resolved all doubts. This paper will look at some Tolstoyan encounters with the concept of integrity, first of all by exploring some of the conversion experiences of key Tolstoyans; secondly by looking at the ways they wrestled with the doctrine of non-resistance and the difficulties of following it to its logical conclusion; thirdly by looking at their relationships with other reformers, and the compromises this invited; and finally by looking at the trajectories of some Tolstoyans, from those who renounced their beliefs, to those who were driven to bankruptcy and mental illness; to those who finally sought a compromise between the society of their time and their Tolstoyan beliefs. The speaker of a literary reportage (the “reporter”) has quite a powerful position. He informs us about persons, phenomena, or parts of the world, which are unknown to us. And as long as we read reportages in the way they are meant, namely as informing us about this event or that situation (and not merely as a work of literary art, i.e. a beautifully written piece that might well be fiction), we rely on the reporter being trustworthy. Seeing some of the characteristic features of the reportage, e.g. the many judgements about say historical, socio-political, sometimes (almost) philosophical, sometimes aesthetic, not rarely ethical aspects, which often are woven into the observations, the necessity of the reporter’s integrity comes to the fore. Apart from the moral perspective, she must be well informed, and she must tell us honestly about her encounters. On the basis of Henryk Sienkiewicz’s Letters from the journey to America (Listy z podróży do Ameryki, 1876-1887), I would like to enquire into the figure of the reporter. In what ways is he graspable in the text? And how is his integrity marked (or created) by the text? In order to come to terms with the reporter as a person, I shall contrast him with the narrators of selected stories by Sienkiewicz that are related to his stay in the United States. In contrast to the protagonists in literary texts, both the reporter and the narrator can be grasped mostly because of the way in which they speak and about what they speak. As I would like to suggest, what we come to know about these two figures differs significantly. In either case integrity is connected to various aspects of coherence of the speaker’s depiction. The ways in which his or her coherence is achieved in literary texts poses questions about what traces of a person come to bear in different literary genres. How is it that we are able and willing to conceive of them as persons, to regard them as having integrity, and hence to think of them as trustworthy?